I got inside the house today, saw a tradesman's working and jumped at the opportunity to have a look. I haven't been inside for a few weeks. The last photo is where I got my bathroom inspiration from and I've tried to replicate that but on a budget. 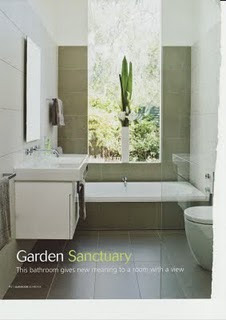 We are having the wall hung vanity units, they are in the house but yet to be installed. The kid's bathroom is the one with the bath in it and the shower screen is yet to be installed as well. In our bathroom we are having a frameless glass screen. I can't wait to have a relaxing bath, it's so deep! The painting is still to be done, white on the sides and a darker color to match the tiles on the back wall although I'm not liking how the window in the kids bathroom is not centered. Yes I will be mentioning the window with my builder tomorrow, it's not something you notice from the outside. I'm just one of these people that like's everything centered, lol. I hope I can pull off the look too.